Hamill's adaptation places the focus on the four March sisters and their cozy home. 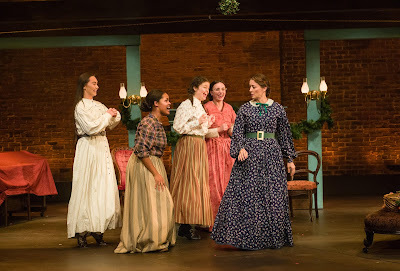 Throughout the play, the sisters perform a melodramatic play written by Jo March, and each time the story of Rodrigo returns, it highlights the changes happening to the March sisters. C. Michael Menge is dynamic as Jo, and the adaptation leans hard into Jo's tomboyish behavior, as well as demonstrating the passions and contradictions of this character. Although Jo doesn't want the family to change, she's also the most ambitious of the sisters. Christine Weber is stoic as oldest sister Meg, but has a lovely opportunity later in the play to express her own frustrations. It's difficult to know what to do with the character of Beth, played by Isabella Star LaBlanc, who seems more like a symbol of impending change than an actual person. Megan Burns puts a lot of energy into the petulant youngest sister, Amy, and I admired her performance while disliking the character. Tyson Forbes, Jim Lichtscheidl, and Wendy Lehr round out the cast in various roles. I was disappointed by the lone appearance of Aunt March (Lehr), Jo's employer and bane of her existence. Her tirade against Jo and her family includes the suggestion that rather than fighting this war, President Lincoln should focus on "making the country great again," or something similar enough to provoke an audible reaction from the audience. It seems odd that it's the only political mention in the show: though the characters refer often to the Civil War taking place at the time, there's no discussion of what the war is being fought about, though Aunt March refers briefly to Mr. March's abolitionist beliefs. The play ends at a more unsettled place than the book, allowing for a broader interpretation of Jo's lack of response to Laurie's romantic overtures, while not overtly changing the well-known and beloved story. It's a delicate balance for the playwright and director, but I think they probably managed it. Some of the recurring motifs and themes are a little heavy handed, but overall it was an interesting take on a classic.